What's also very apparent in a section on history and philosophy of science is why so many scientists are dubious of philosophers and historians of science. When an adult can seriously suggest that we can't say that current science is better than that of the Romans - all we can say, suggest these philosophers and historians of science, is that our science is different - it makes it very clear that some academics have spent far too much time in ivory towers examining their philosophical navels and really haven't got a clue about the real world. We then get into the main content of the gradual process of science, in the current sense of the word, coming into being. It's certainly interesting in a dry way to see this analytically dissected, though the slightly tedious nature of the exposition makes it clear why popular science has to simplify and concentrate on the narrative if readers are to be kept on track. I appreciate that an academic like David Wootton wants to ensure that every i is dotted and t crossed, but I think that all the arguments of this book could have been made in half the length by cutting back on some of the detail and repetition. This book, then, is not popular science in the usual sense, but neither is it a textbook. If you are prepared to put the effort in, you will receive huge insights into what lies beneath: one view of the true history of science. That's why the book gets 5 stars. I've learned more about the history of science from this one book than any other five I can think of that I have read in the past. I have to emphasise that 'one view' part, though. History is - well, not an exact science. 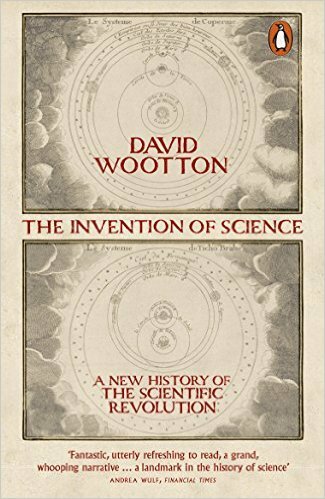 As far as I can see (I'm not equipped to criticise the content) this is a superbly well researched piece of scientific history, but in the end, the conclusions drawn are down to Wootton and he enjoys making it clear where he is strongly contradicting other historians of science. There's a huge amount to appreciate here. Wootton convincingly demolishes Kuhn's idea that scientific revolutions require heavy disagreements among scientists, showing how exposure to experience (often thanks to new technology, such as the telescope) can swing the argument surprisingly painlessly. And he shows what a remarkable influence words have on the development of science (music to the ear of a writer). Perhaps most remarkable of all is Wootton's careful, very detailed exposition of the idea that the real trigger for 'modern' scientific thought was Columbus's discovery of America, which demolished the existing model of the Earth and made it possible to see how experience can triumph over the philosophical quagmire of authority. If you've a fair amount of time to spare and really want to dig into the way that the scientific revolution came about, I would heartily recommend giving this title a try.